Samsung announced the Samsung Galaxy S4 Mini today.. but is this really a mini version of the full-sized S4 after the disappointment of the S III Mini? The answer is simply.. no. The S4 Mini is not a mini version of the S4, it's a completely different and much less powerful handset. Although the specifications of the "Mini" are not bad, they are in no way close to the fully-blown S4. Yes, its about 25% lighter and has a 20% smaller footprint, so it's definitely not as massive as the S4, but that really is about all it has going for it. It looks like a pretty cynical marketing exercise by Samsung to try to pass off this inferior handset as anything like the Galaxy S4. Unfortunately, Samsung will probably convince many media outlets and customers that it is such a thing..
Editorial: Has BlackBerry just shot itself in the foot? This week BlackBerry announced that they were porting their popular BBM messaging application to Android and iOS, and it also gave a preview of the upcoming BlackBerry Q5 device that should be cheaper than the existing Q10. We don't know much about the Q5, for some reason BlackBerry aren't very forthcoming about the specifications, but a cheaper handset is definitely needed to replace the popular but obsolete BlackBerry Curve range. 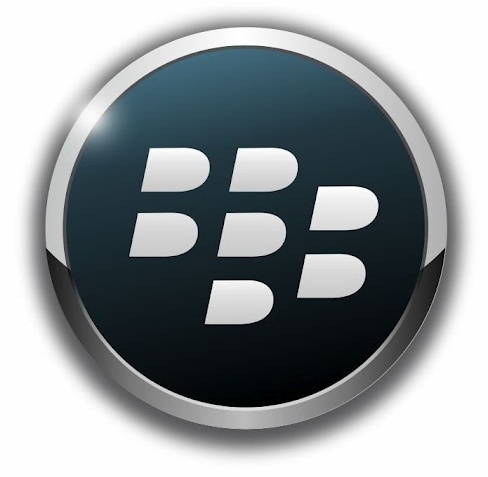 Although the Curve is widely used by businesses trying to stretch their budget, it is the handset of choice for most BBM users who tend to be a youthful lot. So.. on one hand, BlackBerry is saying to BBM users "here's a nice new phone for you".. but then they're saying "but you don't need it". It certainly looks like BlackBerry have severely dented the market for the Q5 before it even gets to the shops. Obviously, porting BBM to Apple and Androids is a good move for the BBM platform, but BlackBerry are going to give it away for free and it's hard to see how they will generate any revenue from it, and certainly not enough to make up for the lost handset sales. Of course, locking BBM users into BlackBerry handsets would probably eventually kill the platform off anyway, and it's been clear for a while that BlackBerry needs to do something to reverse its previous dead-end strategy. But the danger is that BlackBerry have just accelerated the decline in hardware sales. Despite the modest success of the rather good Z10 and Q10 handsets, BlackBerry are still in a desperately poor strategic situation. The BlackBerry 10 OS was two years late to market, and had they launched BB10 smartphones instead of the disastrous PlayBook (which BlackBerry can't even seem to give away) then it might have made a difference. In our view, BlackBerry passed to point of no return some time ago, and the long-term future seems to be pretty bleak. Yes, there are still a lot of BlackBerry fans about, but it seems to be a steeply declining user base. We suspect that the company will continue to slowly bleed to death during 2013 and will then have to throw in the towel at some point next year, with the remaining parts sold off to interested parties. We hope that we are wrong though..
Waterloo, ON – BlackBerry® (NASDAQ: BBRY; TSX: BB) today introduced the BlackBerry® Q5, a new youthful and fun BlackBerry® 10 smartphone for selected markets. The BlackBerry Q5 smartphone features a QWERTY keyboard with discrete keys in a stunning youthful design that is confident, fun, and bold. Every feature, every part of the BlackBerry Q5 has been built to provide a fast, effortless experience that flows and moves with you to help you explore, create, and share while on the go. 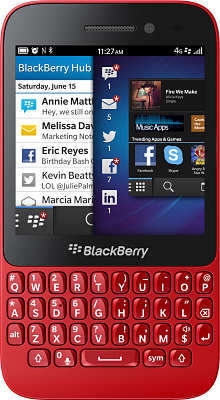 The BlackBerry Q5 features a classic BlackBerry Keyboard with discrete keys that has been re-engineered and elegantly designed to help you type fast, accurately and with the least amount of effort. Plus with Instant Action shortcuts you can type to perform tasks faster. The BlackBerry Q5 smartphone gives you the best of both worlds – a classic QWERTY keyboard for optimized communications and a 3.1” touchscreen for all the rest. London, UK - Nokia today introduced the Nokia Lumia 925, a new interpretation of its award-winning flagship, the Nokia Lumia 920. The Nokia Lumia 925 introduces a metal design and showcases the latest PureView camera innovation, new features and third party applications coming to the Nokia Lumia range. Nokia also announced Hipstamatic's new app, Oggl, will arrive on Nokia Lumia smartphones, allowing people to take and share high quality pictures with like-minded creatives and photography enthusiasts from around the world. In addition to sharing photos on Oggl, users can simultaneously share photos on social networks including Facebook, Twitter, Foursquare, Tumblr, Flickr and Instagram. "We keep innovating," said Jo Harlow, executive vice president of Nokia Smart Devices. "We're advancing experiences on the Nokia Lumia portfolio whether that means great new benefits for an existing Lumia owner, or bringing new showcase devices like the Nokia Lumia 925." The Nokia Lumia 925 introduces metal for the first time to the Nokia Lumia range, bringing appeal and unique benefits like increased robustness. The polycarbonate back comes in white, grey or black. A wireless charging cover can be clipped onto the back of the phone to take advantage of Nokia's extensive wireless charging accessories and ecosystem. Covers, sold separately, come in white, black, yellow, and red. Leading Nokia services, such as the HERE suite of integrated location and navigation services and Nokia Music for unlimited streaming of free music playlists, add to the great proposition offered by Nokia's latest smartphone. 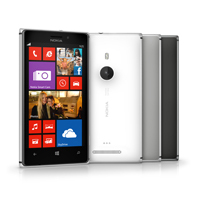 The Nokia Lumia 925 is being introduced into Europe with Vodafone, along with other operator and retail partners. Patrick Chomet, group director of Terminals at Vodafone said: "The new Nokia Lumia 925 is a sleek and sophisticated smartphone delivering great performance and outstanding imaging. We look forward to offering the Nokia Lumia 925 across our markets on Vodafone Red, as well as other tariffs, enabling customers to make the most of their new smartphone on Vodafone's fast and reliable network. Vodafone customers will also have exclusive access to a 32GB version of the Nokia Lumia 925, giving them even more capacity to store all their content for personal and business use." Terry Myerson, corporate vice president, Microsoft Windows Phone Division, added: "Together with Nokia, we continue to change the way people think about smartphone cameras. The work Nokia has done with the Lumia 925 further enhances the imaging capabilities of the Lumia smartphones." 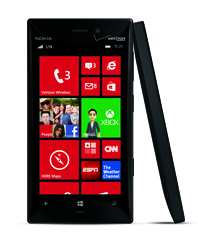 Sunnyvale, Calif., USA - Nokia today announced the Nokia Lumia 928 smartphone, the latest installment in Nokia's Windows Phone 8 lineup, exclusive to Verizon Wireless. With Nokia's award-winning PureView imaging innovation, including optical image stabilization, the Nokia Lumia 928 enables people to capture bright, blur-free photos and videos, even in low light conditions such as indoors or at night. Great looking images come easily when snapping them with the smartphone's 8.7MP camera featuring a high-quality, wide angle Carl Zeiss lens. The Nokia Lumia 928 also comes with powerful Xenon flash to freeze the moment. In addition to amazing imaging and video capabilities, the Nokia Lumia 928 offers rich distortion-free audio capture, even in noisy conditions. Built with three high-audio-amplitude-capture (HAAC) microphones and one of the most advanced loudspeakers available for smartphones, people can record and play back the sound just like they first heard it, all the way up to 140db - the sound equivalent of an airplane taking off. These features shine when using Vyclone, a new app for Windows Phone that lets people co-create, sync and edit multiple views of a shared moment. "Whether you're attending a party, a concert or a sporting event with friends, the Nokia Lumia 928 excels at capturing high-quality video, audio and blur-free photos of life's most share-worthy moments," said Matt Rothschild, vice president, Nokia North America. "Verizon Wireless customers, we heard you and the wait is over - we're excited to offer a Nokia flagship smartphone, specially designed and optimized for the nation's largest 4G LTE network." Powered by Windows Phone 8Windows Phone 8 offers a truly personal smartphone experience, with an iconic Start screen that can be easily arranged to reflect individual priorities and animated Live Tiles for real-time updates on the people and things that matter most. With the same modern look and feel, Windows Phone 8 is built to work seamlessly with Windows PCs and tablets, Microsoft Surface devices and the Xbox 360 console so that files, music, pictures and videos can be accessed in whichever way is most convenient. The Windows Phone Store features more than 145,000 apps for customers to choose from, with hundreds added every day. Getting things done while on-the-go is easy with Internet Explorer 10 for faster, safer browsing and Microsoft Office Mobile integration. New Delhi, India and Espoo, Finland - Nokia today unveiled the first of a new family of Asha smartphones with the introduction of the Nokia Asha 501. The handset pushes the boundaries of affordable smartphone design with bold color, a high-quality build and an innovative user interface. The Nokia Asha 501 is the first device to run on the new Asha platform, which is designed to make the experience faster and more responsive. The Asha platform also helps developers to create, publish and make more money from apps made specifically for the new generation of Asha devices. The new Nokia Asha 501 was purpose-built to give people the best possible mobile experiences at an affordable price. It is highly efficient, with an industry-leading standby time of up to 48 days*. The Asha 501 is the first smartphone built on the new Asha platform, which leverages Nokia's investments in Smarterphone, a company which Nokia acquired in 2012. Many of the most popular applications are already available or in development for the Nokia Asha platform, including CNN, eBuddy, ESPN, Facebook, Foursquare, Line, LinkedIn, Nimbuzz, Pictelligent, The Weather Channel, Twitter, WeChat, World of Red Bull and games from Electronic Arts, Gameloft, Indiagames, Namco-Bandai and Reliance Games. WhatsApp and other key partners continue to explore new Asha. 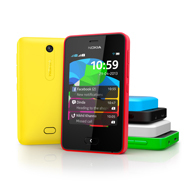 "We are very happy to offer the new Nokia Asha 501 through our subsidiaries in the continent. We are certain that this innovative device will follow the successful footprint of the Nokia Asha family, combining affordability with the best communication and Internet browsing capabilities," said Marco Quatorze, Value Added Services Director for America Movil. A leading operator in the Asia-Pacific region, Telkomsel is also supporting the arrival of the new Nokia Asha. "The Nokia Asha 501 will help us to boost the mobile Internet in Indonesia. It is powered by innovations like the Nokia Xpress Browser, based on a very efficient data consumption technology which allow us to offer best data plan tariff for people," said Alistair Johnston, Chief Marketing Officer (CMO) of Telkomsel. "We have a billing agreement with Nokia that supports the creation of local applications absolutely relevant to Indonesian consumers." The popularity of the Nokia Asha family has also prompted innovative approaches to bundled mobile services. Nokia, Facebook and mobile network operator Airtel announced they have joined forces to offer data-free access to the standalone Facebook app, as well as the mobile site m.facebook.com. By the end of second quarter, current Airtel subscribers in Africa and India** will be able to enjoy unlimited, data-free access to Facebook from their Nokia Asha 501 for a limited period of time. Commenting on the partnership, Andre Beyers, Chief Marketing Officer for Airtel Africa, said: "The collaboration with Nokia is in line with our strategy of enabling people to access data in Africa as we seek to bridge the digital divide across the continent. We're already witnessing tremendous growth in data use across the 17 countries where we operate. The provision of free Facebook access is an excellent proposition to the millions of Airtel consumers. We are extremely delighted to partner with Nokia to give our consumers an even better mobile experience." Telkomsel will provide a specific Nokia Telkomsel Asha data plan that offers up to 500 MB of data use and includes 60 minutes of calls and 60 SMS. The company will also provide a one month free data plan to consumers using Nokia Asha 501 that can be used for all mobile Internet activities including access to Facebook or downloading apps. "This bundle is a great way to discover Facebook on your Nokia Asha and enjoy the experience for longer without worrying about data charges," said Vaughn Smith, VP mobile partnerships, Facebook. "Working in close partnership with Nokia and global operators made this offer possible and we're excited to help connect the world on Facebook." MTN, a leading operator across Africa, said it will also offer the Nokia Asha 501 and ease access to Facebook. "We are excited to support this initiative with Facebook in Nigeria and Zambia and we are looking forward to expand it to other markets," says Pieter Verkade, group chief commercial officer at MTN. - Suggested pricing is 99 USD before taxes and subsidies. Read more about the Nokia Asha 501 on Nokia Conversations: http://conversations.nokia.com/?p=120951. PRESS RELEASE – Krusell - TOP-10 selling phones for April 2013. The interest for Xperia Z is still strong which shows its top position for the second consecutive month of Krusell’ s top seller list says Ulf Sandberg. Yet a new competitor for Xperia is right around the corner, the Samsung’s Galaxy S4 which recently hit stores and is predicted to be a best-seller. Thus, with these kinds of players it is no question that Apple will struggle in the future race of the consumer, he ends. The Swedish manufacturer of carrying cases for portable electronics, Krusell, releases its Top 10-list for April 2013. The list is based on number of pieces custom made mobile- and smartphone cases ordered from Krusell during April 2013. The list of Krusell is unique due to the fact that it reflects the sales of phones in six continents and in more than 70 countries around the globe.